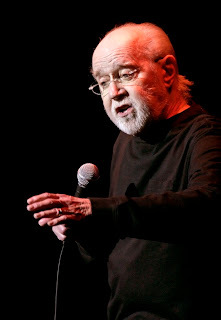 Destined to be forever known as the man of "Seven Dirty Words," as the comedy world continues to mourn George Carlin -- who died Sunday at 71 -- a quieter angle of the legendary, controversial comic's personality has come to light. A cradle Catholic who became, arguably, the country's best-known unabashed atheist -- among the un-bleepables, he once called organized religion "the mother of all fairy-tales" (and was cast, with intentional irony, as a cardinal in Kevin Smith's 1999 film Dogma) -- the Washington Heights-born commentator on matters as diverse as using credit cards to buy Goobers, radio and the famous bit on "stuff" kept a soft place in his heart for his almost-alma mater: Cardinal Hayes High School in the Bronx... from which he got the boot in the early '50s. Mr. Carlin arrived at Hayes in the early 1950s, part of the class of 1955. But after three semesters, he left the school and enrolled — briefly, too — at Bishop Dubois High School in Harlem. Over the years, he would drop references to Hayes, whose colors are the cardinal and gold (in one talk show appearance he went on about how the colors looked suspiciously like red and yellow). Such references made alumni (including this writer, class of 1975) shout, “He’s talking about Hayes!” as any weary spouse can attest to. A tape of his 1983 appearance at the fund-raiser was shared among classmates like underground comedy, and it was introduced to a new generation last year when the school used it for a fund-raising video. In it he talks about how Hayes was “the coolest school” around. The 1983 fund-raiser was the school’s first Hall of Fame dinner-dance, and it was to honor Msgr. Stanislaus P. Jablonski, a legendary dean of discipline who was better known as Jabbo, the Mean Dean and the Sinister Minister. That Carlin would be chosen to honor the man who kicked him out of a school that preaches a religion he no longer believed in did not go off without problems. Some members of the alumni association feared it would send the wrong message, said Neil Sullivan, a member of the association at the time. But the comic jumped at the chance to honor Monsignor Jablonski, who had remained close to the Carlin family, Mr. Sullivan said. And unlike some other past honorees, Mr. Carlin paid his own way and asked for only one thing — a Hayes baseball jacket. The 1983 dinner was held not at Hayes’s then-dicey South Bronx location, but at archrival Mount St. Michael Academy in the northern Bronx. “What are we doing at the Mount without the football team?” he started, and off he went. The rest of the routine had spot-on impersonations of teachers and deans of his era, and wry takes on how Irish-Catholic teenagers coped with life at the button-down, disciplined school on the Grand Concourse. He captured the hilarity of teenage wise guys dreaming up outlandish hypotheticals in religion class as they tried to stump the priest about what is or isn’t a sin. Short version: When they trust you enough, sometimes, in some cases, it’s not a sin. His reply was the only vulgarity of the night. It was, as we used to describe it in this paper, a barnyard epithet.